Director of NASA’s Wallops Flight Facility William Wrobel will talk and answer questions during a free public event Friday, Jan. 16, at 1 p.m. in the Elvey Globe Room on the University of Alaska Fairbanks campus. Wrobel will provide an overview of the work conducted by NASA’s Wallops Flight Facility. He also will highlight Poker Flat Research Range's 2015 sounding rocket launch season, Jan. 13-27. At 2:09 a.m. on March 3, 2014, aurora researchers launched a NASA sounding rocket over a display that rippled above northern Alaska. The rocket flew through the electric particles flowing down to create an aurora, allowing scientists to measure both the particles and the electric fields changed by the aurora. On Feb. 9, 2014, a team of Geophysical Institute researchers launched a 10-foot carbon-fiber rocket on a seven-minute flight from Poker Flat Research Range north of Fairbanks. They fired the rocket to test its capabilities as a low-cost test vehicle for space physicists and other scientists who send missions through the aurora. 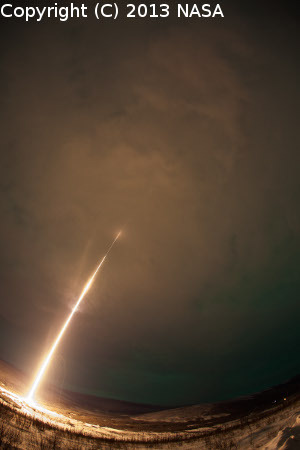 ANCHORAGE, Alaska — It was a successful blast off at the Poker Flat Research range earlier this week. The mission called "VISIONS” (Visualizing Ion Outflow via Neutral atom imaging during a Substorm) set out to gather information on how the aurora heats and slingshots oxygen out of the upper atmosphere. On February 6th, the skies were cloudy and the aurora wasn't out, but things quickly changed downrange at Kaktovik. Scientists say the rocket performed well and the on-board instruments executed their jobs as planned. NASA scientists in Poker Flats, Alaska, have been waiting since Saturday for the right weather conditions to launch a sounding rocket into the green aurora-lit skies, where it will fly to an altitude of 500 miles and capture data and imagery from within and above the northern lights.